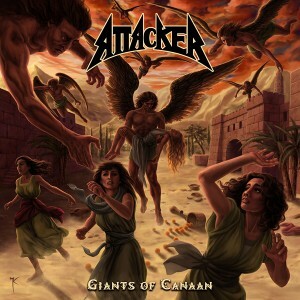 ATTACKER "Giants of Canaan" album details and pre-order. "Giants of Canaan", the 5th album of the legendary US power/ heavy metal act ATTACKER, will be released on February 2nd at the Metal Assault festival where the band will perform alongside other great traditional metal acts like MANILLA ROAD, BROCAS HELM, RAVEN and their label-mates SKELATOR. If you go to the festival, you will have a chance to buy the CD directly from our stand there (we should also have the T-shirts with the album art design!). "Giants of Canaan" was recorded at Katalomi Studios in New Jersey, engineered and mixed by Patrick "Taps" Guden and drummer Michael Sabatini, and mastered by the renown engineer Alan Douches at West West Side Music in New York. This year marks the 30th anniversary of the band but in spite of their age they have more stamina than many young bands. The new album contains just pure classic heavy/power metal ATTACKER has been known for since years and it perfectly captures what this band is all about. Two songs from the album, "The Hammer" and "Black Winds Calling", are up on our YouTube channel: here and here. We have also prepared a short album promo clip (featuring a fragment of the title song) which you can watch at this location. Check more info about "Giants of Canaan" and see the high-res artwork on the page of this release. From now on until February 2nd you can pre-order ATTACKER "Giants of Canaan" CD from our SHOP page, with 2,00 Euro discount. After this day the price will revert to the standard 12,00 Euro for the CD. All pre-orders will be shipped first, after we come back from the Metal Assault festival, that is on 5th-6th of February. You can also pre-order the album as digital download (in lossless formats: FLAC, MP3 320 kbps and others) directly from us, from our Bandcamp page. With the download from Bandcamp (and only from Bandcamp) you will also get an exclusively designed (different from the CD booklet) screen-friendly e-booklet with lyrics, artwork and photos. Later on the album will be distributed digitally by CD Baby and made available also from iTunes, Amazon MP3, eMusic and other retailers.